Ally McCoist would welcome a return to football management despite his Ibrox trauma, according to fellow former Rangers manager Walter Smith. 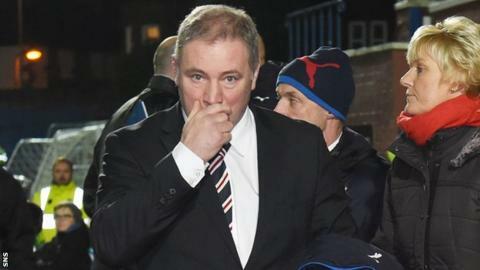 McCoist stood down as Rangers boss in December as his side fell behind Hearts in the Scottish Championship race amid the club's financial problems. "I would think he'd want to try it again," Smith suggested of his former assistant at Rangers and Scotland. "He is a resilient boy. He'll recover from that." McCoist, who is Rangers' record goalscorer, also played for St Johnstone, Sunderland and Kilmarnock and was a BBC sports pundit and television quiz captain on A Question of Sport before moving into coaching. Smith thought managing another Scottish club in the short term would not be a natural move for someone who has been in charge at one of Scotland's Old Firm clubs. "But, if there was an opportunity south of the border, I'm sure he would be likely to take it," he said. Smith, who had groomed McCoist as his successor, could understand why the 52-year-old had tendered his resignation at a time of yet more boardroom disagreements. "After a number of years where there has been a fair amount of turmoil, I wasn't surprised he took the decision," he said. "There have been a whole set of circumstances that made it awkward for him. It would have made it awkward for any manager." Smith suggested that McCoist will put it down to experience and move on. "What happened to Alasdair happens - it happened to me," he added. "It's happened to nearly every manager. "I'm sure, once he's had time to take everything in, takes a couple of deep breaths, he'll be ready to go back into the game again and I hope he does. "When results don't go for a team, and there were a few bad ones near the end there, then it's not a surprise to any manager when that happens."